Rendering of Valley Baptist Health System's planned micro-hospital in Weslaco. 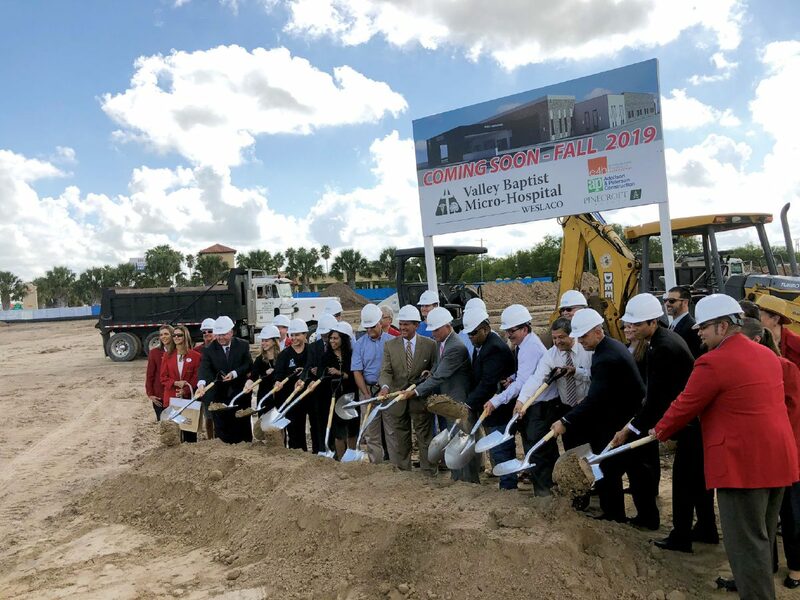 WESLACO — Valley Baptist Health System, the operator of full-sized hospitals in Harlingen and Brownsville, is extending its reach by breaking ground Thursday on the first micro-hospital in the Rio Grande Valley. The micro-hospital will house an emergency and trauma department and offer inpatient, outpatient, imaging, respiratory and ambulatory services inside a 28,000-square-foot facility off West Interstate 2 in Weslaco. 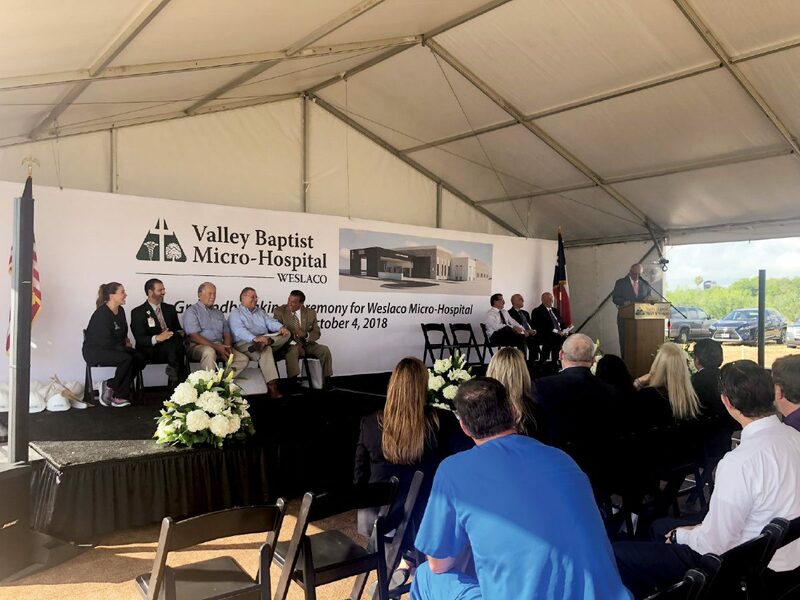 Valley Baptist plans to offer patients a “higher level of care, without having to go to an acute care hospital,” such as its facilities in Harlingen and Brownsville, according to Valley Baptist Health System CEO Manny Vela, who spoke at the ceremony along with local, county and state policymakers. Valley Baptist owns clinics in the county, but the micro-hospital will be its largest healthcare facility in Hidalgo County. Valley Baptist representatives chose Weslaco after surveying patients’ zipcodes. They found Donna, Weslaco and surrounding area residents travel to its hospitals in Cameron County. 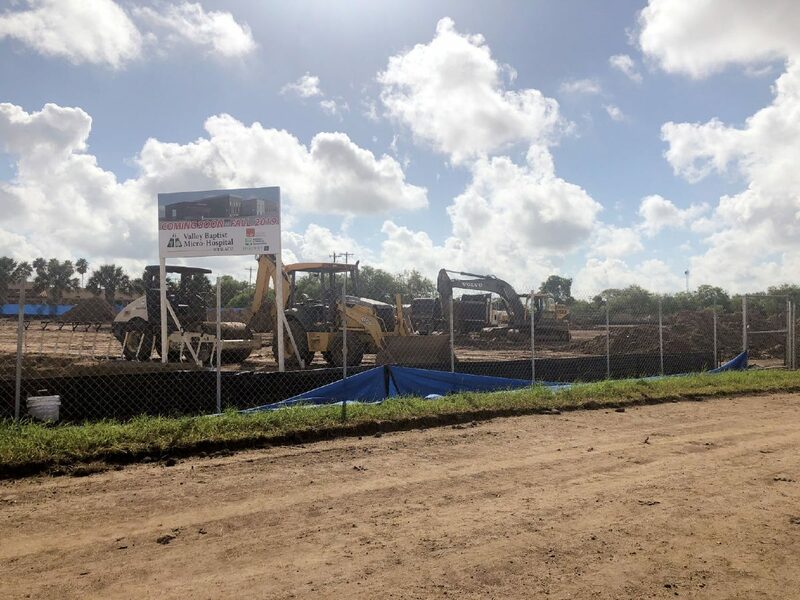 The construction site for a new micro-hospital Valley Baptist Health Systems is planning in Weslaco is seen Thursday. Weslaco city leaders, members of the business community and area dignitaries join representatives of Valley Baptist Health Systems during a groundbreaking ceremony in Weslaco on Thursday for a new micro-hospital planned in town. Representatives of Valley Baptist Health Systems break ground Thursday on a new micro-hospital planned in Weslaco. Joining them were were city officials and local leaders, as well as members of the business community. “It’s more convenient for them, and I think family brings healing power,” he said, while construction crews worked nearby on micro-hospital grounds. Policymakers present at Thursday’s ceremony expressed enthusiasm that residents would have another healthcare facility to choose from in Hidalgo County. Prime Healthcare runs the Mid-Valley’s sole full-fledged hospital — Knapp Medical Center — established in 1962. Still, some patients choose Valley Baptist Medical Center in Harlingen, which in March launched the Rio Grande Valley’s only major trauma care center. One of those former patients, state Rep. Armando Martinez, D-Weslaco, needed surgery at Valley Baptist Medical Center in Harlingen after sustaining a gunshot wound to his head from a stray bullet on New Year’s Day in 2017. In 2015, South Texas Health System opened a stand-alone emergency room in Weslaco, located less than a mile from the spot where Valley Baptist is building its micro-hospital. Valley Baptist Micro-Hospital will serve “anybody with a full-fledged emergency of any kind,” Vela said. It’s slated to open late next year at 1021 W. Interstate 2 in Weslaco, next to PlainsCapital Bank.